Leading Eye Hospital in South-East Europe. Immediate Discharge Upon Procedure Completion. Most of the Surgeries Performed in Local Anesthesia. 4 World Top Lasers for Laser Vision Correction, "ALL LASER LASIK". After surgery, No More Glasses for Distance and Near Vision! At its 6 centers, the clinic Svjetlost has 45 ophthalmologists and one anesthesiologist (2 full time professors of ophthalmology, 2 assistant professors, 3 doctor of science and 1 master of science), 9 ophthalmology specialists and more than 60 other employees. The first transplant of stem cells of the cornea in this part of Europe was performed at Svjetlost Eye Clinic. Thanks to this surgery a 30 year old patient regained his eyesight, 16 years after injuring his eye with tear gas. 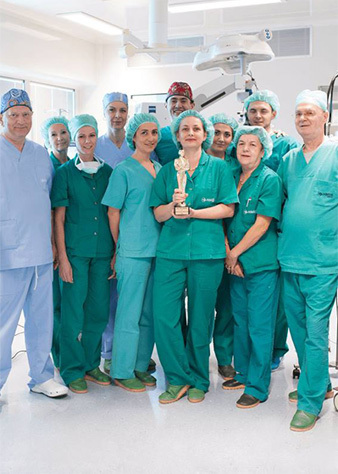 Svjetlost Eye Clinic was awarded the prestigious "Best Regional Hospital" award in Cannes, as a recognition of excellence in the field of ophthalmology at the European level. Four expert surgeons from Eye Clinic Svjetlost have performed 5 complicated close up eye surgeries in just about 60 minutes at international ophthalmic surgery Symposium ''Best Live Surgery Award'' held as part of surgical congress "Videocatarattarefrattiva Milano". My experience was positive and pleasant, and I am more than satisfied with the results. All praises to the best ophthalmologic Clinic. I am delighted that I have put my vision in the hands of such a team. I am very satisfied and delighted. After the surgery, I have no problems. I was born again! With friendly staff and a smile on their face, Polyclinic Svjetlost is a place where your dreams come true.